Fujifilm GFX Updates: January Fujinon GF100-200mm F5.6 R LM OIS WR Event? and Will GFX100 be X-Trans Based? The Fujifilm GFX has been huge for Fujifilm and the rumors have been flying on sites like Weibo in addition to conjecture by other sites being mistaken as rumors. I received a couple of tips today, which are always appreciated, and I want to talk about them since they were numerous. 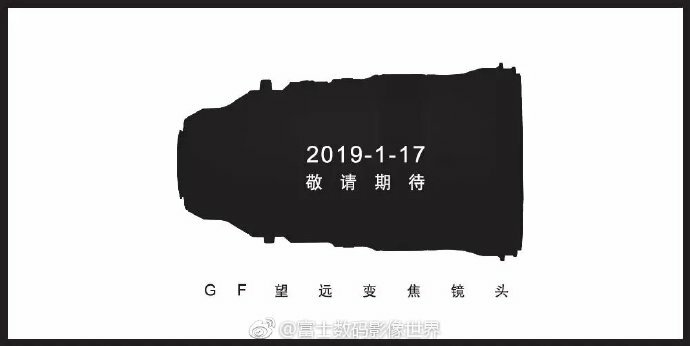 First, there is a GF lens teaser going around Weibo for an event on 1-17-2019, which is a few days from now. FujiAddict is only aware of an event coming around February 14th so this could be a fabrication, but the Fujinon GF100-200mm F5.6 R LM OIS WR could always come earlier. The other more surprising rumor comes from thephoblographer that made a leap from newly leaked photos of the GFX100 to the GFX100 might be X-Trans based in a recent post. The rumor is based on an interview from a previous thephoblographer post with Fujifilm where Fujifilm didn’t confirm that the Fujifilm GFX100 would have a bayer sensor or deny it being X-Trans based. This leap requires readers to forget the numerous thing Fujifilm has said about X-Trans and medium format. Fujifilm says that medium format does not benefit from X-Trans and that the technology would require too much processing power even with their 50MP sensor. I am a huge fan of X-Trans technology and would love to see it used on their medium format camera’s, but I doubt this will happen anytime soon since decoding 100MP RAW files will remain computationally prohibitive in the immediate future. Another issue is getting RAW editors to properly decode X-Trans since no one does it perfectly yet. The only way I can see this happen is if Fujifilm drastically changes their RAW file to emulate bayer so that companies like Adobe can use their standard decoder instead of continuing to improve on their current flawed X-Trans decoder. Decoding a 100MP RAW file is going to be computationally demanding, but not like an X-Trans one so an X-Trans GFX100 is almost certainly not going to happen. This entry was posted in Fujifilm GFX, Fujifilm GFX 100S, Fujifilm GFX 50R, Fujifilm GFX 50S and tagged Fuji GFX, Fuji GFX 100, Fuji GFX 100M, Fuji GFX 100R, Fuji GFX 100S, Fuji GFX 50R, Fuji GFX 50S, Fuji GFX100, Fuji GFX100M, Fuji GFX100R, Fuji GFX100S, Fuji GFX50R, Fuji GFX50S, Fuji Rumors, Fujifilm, Fujifilm GF 100-200mm f/5.6 R LM OIS WR, Fujifilm GF 45-100mm f/4 R LM OIS WR, Fujifilm GF 50mm f/3.5 LM WR, Fujifilm GFX, Fujifilm GFX 100, Fujifilm GFX 100M, Fujifilm GFX 100R, Fujifilm GFX 100S, Fujifilm GFX 50R, Fujifilm GFX 50S, Fujifilm GFX100, Fujifilm GFX100M, Fujifilm GFX100R, Fujifilm GFX100S, Fujifilm GFX50R, Fujifilm GFX50S, Fujifilm Rumors, FujifilmRumors, Fujinon GF 100-200mm f/5.6 R LM OIS WR, Fujinon GF 45-100mm, Fujinon GF 45-100mm f/4 R LM OIS WR, Fujinon GF 50mm f/3.5 LM WR, Fujinon GF100-200mm Fujinon GF50mm, Fujirumors, GF 1.4 TC, GF 1.4x Teleconverter, GF 100-200mm f/5.6 R LM OIS WR, GF 45-100mm f/4 R LM OIS WR, GF 50mm f/3.5 LM WR GFX, GFX, GFX 100, GFX 100M, GFX 100R, GFX 100S, GFX 50R, GFX 50S, GFX100, GFX100M, GFX100R, GFX100S, GFX50R, GFX50S, Medium Format, Super Full Frame. Bookmark the permalink. Trackbacks are closed, but you can post a comment.